Grammy Award winning musician Hayley Williams shot to fame as the lead vocalist of the popular alternative rock band Paramore. The talented singer is not only the lead singer of the rock band but also the primary songwriter and occasional keyboardist. 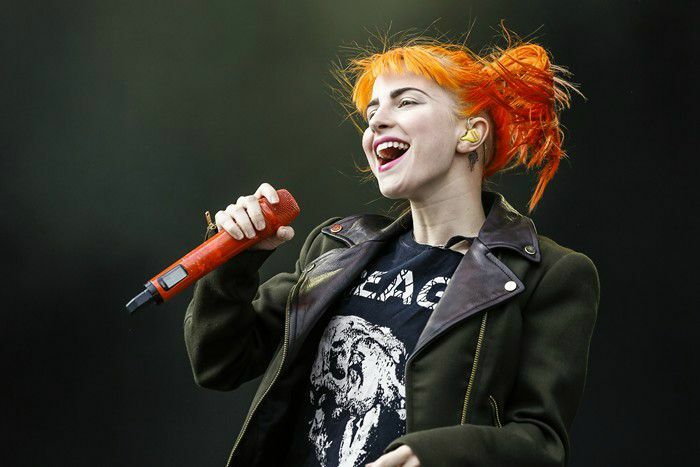 She has given a lot of chartbusting singles such as “Airplanes”, “Stay the Night”, “Ain’t It Fun” and “Decode”. She is best regarded for her pop-orange hair color and also owns a hair dye company, Good Dye Young that produces a range of hair dyes in different color combinations. Hayley Williams was born on 27 December 1988, in Meridian, Mississippi, USA. Hayley Williams started dating New Found Glory’s lead guitarist Chad Gilbert in early 2008. The couple got engaged in December 2014 and married on February 20, 2016. In July 2017, they announced that they were separated. Hayley Williams being the lead artist and founding member of the rock band Paramore, released her debut album titled “All We know Is Falling” on July 26, 2005. The album peaked at number thirty in the Billboard Top Heatseeker. It received Gold certification in the US as well as in the UK. The band has since released a total of five albums, three extended plays, two live albums, eighteen singles, one video album, and nineteen music videos. Though Hayley did not feature in a theatrical film, she had appeared in a documentary titled “Paramore: Born for This” in 2007 and short film Paramore’s ‘Brick by Boring Brick in 2009. She hasn’t been a casting member of any TV show yet. For being the lead vocalist, primary songwriter and occasional keyboardist of the rock band Paramore. Favorite Musical Gear – ’59 Les Paul Jr.
Hayley has a total net worth of $14 million. Her impressive net worth comes from her singing career as well as world tours. Her earlier partnership with MAC Cosmetics for the release of a new makeup collection has certainly fueled to her net worth. Besides Williams owns a hair dye company called Good Dye Young that add considerable value to her net worth. shot by @jason_nocito_studio for @thefader 🖤🖤🖤 styled by @phojoh. makeup/hair by @colormebrian. She moved to Franklin, Tennessee after her parents divorced in 2033. There she took vocal lessons with Brett Manning and used to be part of a local funk cover band, The Factory. She founded the rock band Paramore with Josh Farro, Zac Farro, and Jeremy Davis.. The meber current members of the band include Hayley Williams, Zac Farro and Taylor York. In 2010, the Farro brothers left the group due to differences. In 2014, Williams was honored with the “Trailblazer Award” in the Billboard’s Women in Music Awards for making a unique mark in music and paving the way for other artists. Williams has a unique voice with a four-octave range and is best known for her acrobatic singing style with vocal qualities described as lithe and versatile. Hayley appeared on the April 2013 cover of Nylon magazine. In 2015, she launched the online beauty and music series “Kiss-Off” on Popular TV. She has been vocal about her choice not to smoke, drink, or use recreational drugs. She loves collecting toy frogs.